I have made no secret of the fact that the last few months of my life I have battled a certain melancholy spirit like I never have before. This hasn't been the most trial-fraught time of my life by any means, but this dark cloud has followed me at all times and has shadowed all I have done. I have clung to Jesus, but sometimes it has felt like: just barely. So, it was a very providential moment when I rediscovered that I already had the audio version of this book, and it was just waiting to be listened to. As many people know, John Piper's flagship book is Desiring God: Meditations of a Christian Hedonist. That is a fabulous book, but I have found that, like many others, I don't need convincing that I should desire God as the greatest good. Instead, I find in myself that as much as I know this is true, I don't always feel it. Is there something wrong with me? Am I doing something wrong that I wouldn't spontaneously burst into overflowing admiration for the Creator of the Universe? Why is it that as I seek to pursue obedience to the God who, in love, has redeemed me through great sacrifice, that I am not filled with joy in my pursuit? In other words, "What do I do when I don't desire God?" The answer to that question is found in this book: Fight for Joy. As with all of John Piper's books, this book is filled with Scripture. It is not only Biblically based, it is Biblically guided and thoroughly Biblical in its final assessment. It is laid out in clear terms how one is to Fight for Joy... a Joy that is truly a gift from God, not something that is earned. 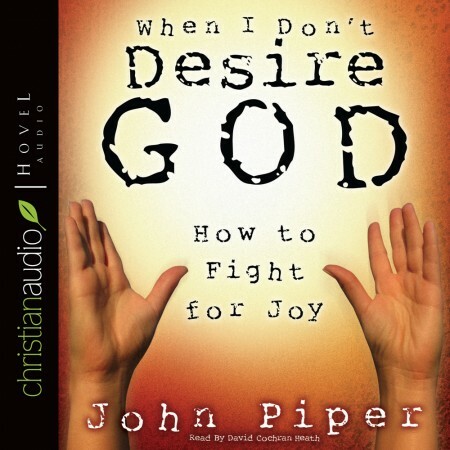 This is an encouraging book, filled not only with Biblical examples of those who needed to fight for joy, but also with a plethora of historical examples. So many of these examples were of saints that I had placed on a higher spiritual plateau, but after hearing of their struggles I find a welling up of hope in my heart. This version was read by David Cochran Heath and produced by Christian Audio. If you aren't much of a reader, I would encourage you to check out an audio book sometime. This one would be a great one to start with!